Secret Wars has brought some fresh views of our Marvel comic universe. Doctor Doom rules Battle World and under his reign our heroes are mashed up into some new combinations. Marvel Cinematic Universe fans will find many of these new views intriguing. These concepts include Jason Aaron and Chris Sprouse’s new take on Thor, police officer of Battle World, in Thors #1. Battle World does not see a lot of murder, Doctor Doom just would not allow it. But when crime does happen he relies on the Police of Doomguard, the Thors, to investigate and bring the criminals to justice. The Thors are faced with a serial killer who has killed five women in five different kingdoms. The Ultimate Thor, who always gets his man, and his partner Beta-Ray Bill are brought onto the case. 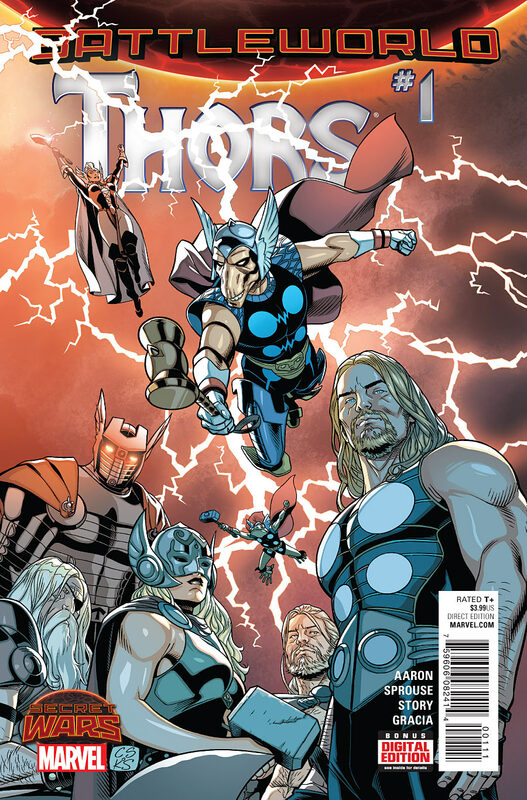 The Thors find an interesting connection between the victims and a visit with an informant may either move the case forward or put a Thor in mortal danger. So, Thor (or Thors) are the police of Battle World! There is part of the concept that seems well, stupid. But I love Jason Aaron and he seems to be able to make great stories out of silly ideas. And to get to the heart of it, I really liked the delivery. I enjoyed the interaction between all the different Thors. And I gave myself a high five when I found Marvel 616’s Odinson. These Thors have a lot of personality and they conflict over very real issues. Not all Thors are truly alike, though in the end they are all Thor. And I mean there are a lot of Thors. There are Thors that are not Thor. There are Thors that are also other heroes we know and love. When one Thor says, I am Thor, he means it! There are even Thors that we would see as silly. But as that Thor points out, he is worthy to carry the hammer! Aaron makes these Thors all seem to work in this world and setup. I bought Thors #1 for only one reason, Agents of S.H.I.E.L.D. variant cover. And I usually do not read these comics because I do not like picking up the story in the middle of an arc. But this year’s variants are mostly #1 issues so I took the plunge. I found myself really enjoying this title. And I look forward to reading the whole arc in trade in the future. Jason Aaron proves again he is a master writer as he takes a silly concept and creates an attractive, exciting and homage filled tale.